Thanks Dave for all you do for TRACK and FIELD! MADISON THROWS CLUB's own ANGELA BOUSHEA, qualified for both the Shot Put and Hammer Throw at US Junior Nationals. To Qualify for Junior Nationals you must be 19 or under and have a qualifying throw. Junior Nationals is an opportunity for the best and the brightest young Track and Field athletes in the United States to compete against one another. The qualifying standards are set each year based on the previous year's marks by throwers from around the country. ANGELA did a great job competing over the weekend. Placing 6th in the Shot. Rotating for the first time in competition after switching from the glide after her Freshman season ended at the University of Wisconsin. She finished 4th in the Hammer throw. Madison Throws Club's own Angela Boushea, Monona Grove '10, was looking to add a top 3 podium finish to her 6th place Shot Put throw from friday. She new it would be tough throwing against a field of Junior Women who all competed in the Hammer g their high school throwing years and into their freshman years of college. Angela has fallen in love with both the wieght and hammer throw in her Freshman year at Wisconsin, yet she admits she has a lot of reps to catch up on. Angela did a great job competing and finished 4th in the event with a throw of 161'0". Just qualifying for the event after less than a year of training is remarkable. I'm so excited to what Angela will do as she continues to work on improving in the weight indoors and hammer outdoors next year. Former MADISON THROWS CLUB thrower Justin Barber, Homestead '10, just completed a redshirt year throwing the University of Minnesota qualified for the event and finished 14th. University of Wisconsin redshirt Frosh, Alex Thompson had his best throw of the day on his final throw to finish 2nd. His throw of 183'0" moved him from 3rd to 2nd and qualified him for the U.S. Junior team that will compete in the PAN AM GAMES in July. Good Luck Alex! Alicia Deshasier who trains in Madison year round finished 3rd in the Javelin for the second consecutive year. The wind was rough on the javelin making it hard for anyone to come close to their season bests. Alicia is still looking for a World 'B' standard to qualify for the world team and I wish her the best as she pursues the 59 meter mark. The premire event of the NATIONAL MEET may be the men's Shot Put. With 7 men in Flight 2 good enough to make the World Team and only 3 spots it will be exciting to see who is ready to THROW FAR. Follow throw by throw updates on flashresults.com. More results, pics and videos soon. Madison Throws Club's own Angela Boushea, Monona Grove '10, had a strong freshman year at the University of Wisconsin, but decided at season's end to switch from Glide to Rotational Shot Put. Its been only 3 weeks of training with the new technique but she had a strong performance in her first big meet. Her throw of 45'2.5" was good for 6th in the nation amongst 19 and under throwers! Congrats Angela! Jessica Maroszek had her second 3rd place finish of the meet. 47'6.5" got her up on the podium again. The Shot Put event was won by University of Wisconsin recruit, Kelsey Card. The recently graduated senior from Illinois bested the field with a new P.R. of 50'8.75". The 12 time ILlinois State Champion has the best Shot Put mark in the country by a High School girl and the 3rd Best Discus mark...look out BIG TEN! Day 1 of the US Track and Field Championships saw heavy competition in the throwing events. Some good Wisconsin connections and even some MADISON THROWS CLUB connections. Jessica Maroszek , Seymour '10, who now throws at Kansas, came in as the top seeded Junior in the country, finished 3rd. Her throw of 157'6" was 1 inch behind the 2nd place finisher. The multiple Wisconsin State Champion had a strong 1st year in college finishing with All-Big 12 honors and was a NCAA National qualifier. She will compete Friday in the Shot Put against MTC's own Angela Boushea. No Wisconsin connections here. But I was lucky enough to watch Kibwe Johnson unleash the 5 best throws of the competition. His winning throw of 263'6" was over 80 meters and was the best throw by an American in 11 years. His speed in the circle is truly amazing. Video here soon. Stephanie Brown-Trafton put the competition to rest early, much like she did when she won the 2008 Olympic Discus Gold Medal on her first throw. Today she threw 207'10" in round 1 and no one could catch her! I got to meet her after the meet- so cool! One of the best competitions I have ever seen!!! A battle started during round 2between JillIan Camarena-Williams and Michelle Carter. Camarena-William's throw of 65'1.5" was the 2nd best throw in US history. Only to be bested by Carter on the very next throw of the competition by one half inch - 65'2". Camarena-Williams would do her best to catch her but would have to settle for second place, despite throwing perhaps the best series ever - with throws of 65'1.25" and 64'11.5" in round 5 and 6. Her round 3 scratch was well over 66' and may have broken the American Record, had she not nicked the top of the toe board. Former UW-Whitewater,2 time NCAA Champion, and friend of Madison Throws Club, Dan Hytinen was the first thrower in the competition. His best throw of the day was 191'7" and was good for 13th. I was lucky enough to watch Dan throw his 201' qualifying throw 2 weeks ago at the Chicagoland Throws meet...it was awesome. Talking with Dan after the meet, he said he didn't feel good in the circle at all. I'm sure it isn't the last we've heard from Dan in the circle. Also, Lance Brooks , who spent 3 weeks training in Wisconsin earlier this year had a strong performance. His throw of 208'1" was good for a podium finish - 3rd. 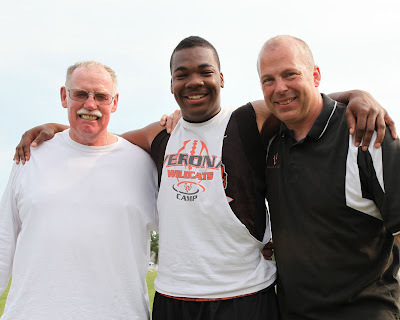 Drex Jackson (sr) Verona won the 2011 WIAA D1 STATE DISCUS CHAMPIONSHIP with a throw of 180'8". Congratulations to Drex and Coach Campbell and Coach Sullivan! 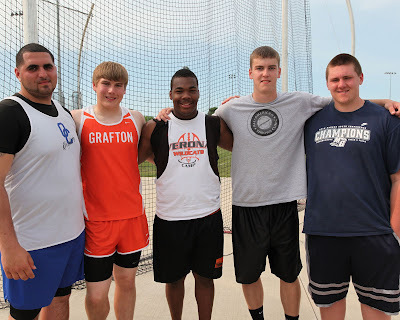 The D1 boys discus competition had been slowed down by rain the past 2 years. However, this year's competition say several throwers with terrific improvements in finals as they jockeyed for positions on the podium. All and all, 5 Madison Throws Club throwers finished in the top 8 of the Division 1 Discus event and MTC swept the top 4 spots on the podium. FANTASTIC work gentleman! 1. Drex Jackson (sr) Verona 180' 8"
2. Jason Zahn (jr) Grafton 176' 6"
3. Rafael Saez (sr) Oak Creek 170'10"
4. Theron Baumann (jr) Monona Grove 169' 9"
8. 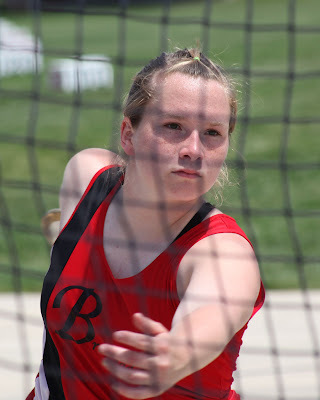 AJ Natter (so) Milton 165' 1"
Congratulations to Madison Throws Club - HEATHER CLANKIE (jr) BRODHEAD, she won the 2011 WIAA STATE GIRLS D2 DISCUS CHAMPIONSHIP with a throw of 129'3". Fantastic job Heather and Congrats to Her Coach Amber Curtis (D2 Discus State Record holder 153'11" - 2002). In D1 Boys Discus sr. Drex Jackson from Verona H.S. won the Crown with a throw of 180'8". Madison Throws Club throwers swept the top 4 spots in the boys D1 Discus and had 5 throwers in the top 8. Behind Jackson's winning performance, Jason Zahn from Grafton was 2nd, Rafi Saez from OakCreek was 3rd, Theron Bauman, jr Monona Grove was 4th, and A.J. Natter, so Milton was 8th. Fantastic job gentleman! MTC GIRLS had great performances in the D1 Discus as well . And another MTC State Champion was crowned , jr KeKe Burks from Madison LaFollette won the competition with a new P.R. throw of 133' 8". She was chased by 2 other MTC throwers, so. Paige Day, D.C. Everest was 2nd with a throw of 128'9". Corinne Franz, so. Madison Memorial also thew a P.R. of 124'11" good for a 4th place WIAA finish. They will all return to battle again next year. HEATHER CLANKIE (jr) Brodhead, Won the Girls Division 2 WIAA STATE DISCUS CHAMPIONSHIP as well as DREX JACKSON (sr) Verona, Won the Boys Division 1 WIAA STATE DISCUS CHAMPIONSHIP on Saturday. Congrats Drex and Heather! Great throws at the first day of State Track! More to come Saturday...watch for pics, videos and stuff on Sunday!